(Canis latrans) In order to avoid being detected by predators, coyotes can walk on their toes to make as little noise as possible. On another note, coyotes can be extremely loud. Our coyotes love to howl with our keepers and the wolves. When everyone gets going it is really something to hear. What does the Coyote eat? Up to 14 years in the wild. How many coyotes can be born at a time? In the spring, 3 to 12 pups are born at a time. Both parents feed and protect the pups. Over most of North America. The coyote reaches a respectable speed of 40 miles per hour. Just like dogs, coyotes use their urine in order to mark their territory. In order to not get detected by predators, sometimes coyotes walk on their toes to make as little noise as possible. Coyotes use a wide variety of vocalizations in order to communicate with one another. Howls, yelps, and high-pitched cries are best known, but they also bark, growl, wail, and squeal sometimes. The coyote has a very developed sense of smell which he uses for finding food and avoiding dangerous predators. They use their smell to spot a prey that is scurrying below the snow. 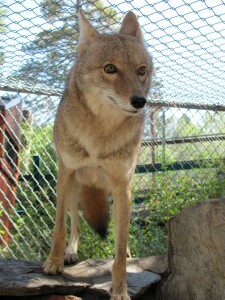 Lyric – is our oldest coyote; he came to us in 2005 when he was about six months old. Someone was keeping him as a pet and he ran away. He was trying to play with people and some residents caught him and brought him to the zoo. Bonzai – came to us from the Fund for Animals as well. Someone had him as a pet and he also could not be released to the wild. Samba – A female came to us in 2013 when she was only a few weeks old. She weighed only 2.4 pounds and was near death, due to anemia, parasites and various other problems.